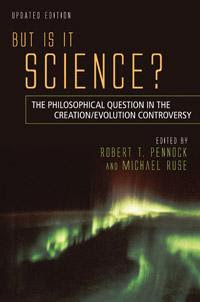 Glenn Branch has a nice review, entitled "Philosophers, Creationists & Serious Brainiacs," of the new edition, edited by Michael Ruse and Robert Pennock, of But Is It Science?, originally published in 1988. But Is It Science? is evidently intended as a sourcebook for university classes in philosophy, the history of science, science and religion, and so forth, and as such it succeeds admirably. But it is, or ought to be, appealing to the general public at large. The creationism/evolution controversy is a perennial feature of life in the United States, with attempts to remove, balance, or compromise the teaching of evolution recurring from the Scopes era to the present day. Even if public interest in intelligent design dwindles after Kitzmiller, as public interest in creation science dwindled after McLean and Edwards, the profound yet misguided discomfort with evolution that actuates such assaults on evolution is bound to remain. Also bound to remain are philosophical controversies over creationism, which — as the Kitzmiller case illustrated so vividly — have the potential to affect the quality of science education across the country and indeed around the world. Go read the review. Better yet, read the review and then buy and read the book. The one thing both sides in this dispute lack the most is an understanding of the history and philosophy of science. Thank you for letting us know about this, John! 0802jejeair jordan retro 11 rouge et noir Faire cet exercice est asics gel nimbus 18 femme un soulagement formidable pour le pied et diminuer l'arthrite de maux de dos. Demandez-vous, qu'est-ce nike wmns air max thea premium camel que je prends au sérieux dans ma vie? Considérez-vous que nike cortez bronze france votre travail est sérieux? Acquiers-tu d'aider les autres? Considérez-vous votre femme chaussure nike roshe run prix comme sérieuse? Prenez-vous vos enfants au sérieux? Essayez-vous d'ajouter de la valeur basket nike femme blanche et noir à tout ce qui précède? Heck oui! Nous faisons nike blazer femme bordeaux tous! Alors pourquoi ne pas appliquer le même plan pour nous mettre en pleine nike france dri fit forme.